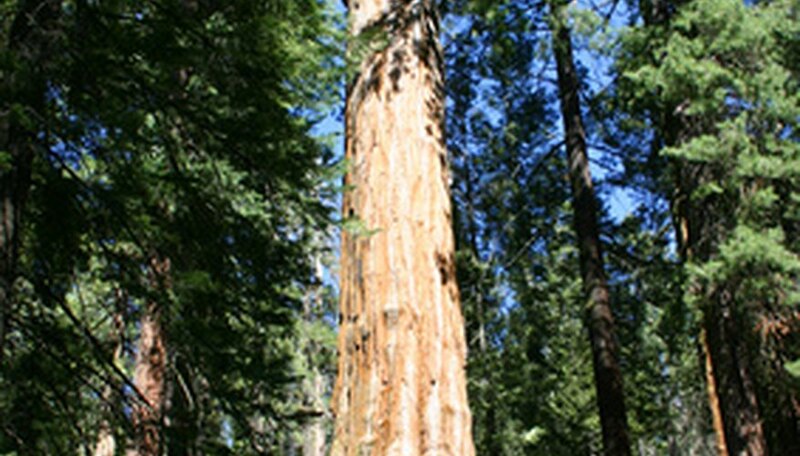 Sequoia trees are redwood trees that have long lives and tend to grow to very large sizes. You might think that these forest giants would be invincible, but in reality they are susceptible to a variety of diseases that can cut their lives short and quickly spread from one tree to another if not detected early and controlled. If you are responsible for the health and "happiness" of one or more sequoia trees, then a familiarity with the signs and symptoms of sequoia illness will likely help you save your trees more than once. Basidiomycetes are fungi that contribute to upper- and lower-limb rot in sequoias. They can also spread via the root systems of trees situated closely together, rendering the roots soft and incapable of proper function so that the tree eventually dies of thirst and poor nutrition. You will likely start to notice leaf death and defoliation on isolated parts of the tree, followed by spreading dead areas that extend around the tree, then upward and downward. In the event of root rot, the only control available is to remove the affected tree before the problem can spread. If isolated limbs are rotting, however, you may be able to eradicate the infection by using sterile pruning to remove the affected limbs and disposing of them either by burning or by removing them from the area. Also called Botrytis cinerea, gray mold causes the dieback of young shoots on sequoias. Young shoots are still green and have not yet become woody, making them weak, easy targets for the infection. If your sequoia has this problem, then you will notice limp, dead shoots hanging from the tree. Gray mold can be prevented through the applications of fungicides, but usually this is not considered appropriate unless it has infested a tree nursery, according to the Encyclopedia of Trees at stihl.com. Sterile pruning of affected shoots should help you control the problem, along with adjusting watering and moisture when possible to create an environment less conducive to infection. Cankers are large, raised, corky parts of the tree. They start small, often in an area with a small surface wound, then expand and can disfigure the tree or even stunt its growth over time. Cankers are caused by a bacterial infection, and can be removed during cold months when bacteria are less active. Blight causes the limbs and shoots of the tree to turn brown or black, and is also caused by a bacterial infection that splashes up from the ground. Remove all affected foliage and wood using sterile pruning. Both of these issues can be treated with pesticides if necessary, but removing the affected part of the tree will usually resolve the issue. Root blight, like root rot, is generally irreversible, however, and will kill the affected tree and others around it if you do not remove the tree completely. Urban Forest Ecosystems Institute: Landscape Notes-What's Up with the Redwoods? What Makes Knots in Trees?